Welcome to National Bait Inc.
Lumbricus terrestris, earthworms, American night crawlers or Canadian dew worms are unquestionably the favoured fresh water bait by fishermen world-wide. Introduced to North America by European settlers, these slippery creatures range from 90 millimetres to 300 millimetres in length and are usually a light pinkish/brown colour. Night crawlers have been exported from Canada and the U.S. to various parts of the world since the 1950's, when angling became a flourishing leisure activity. National Bait exports millions of these night crawlers annually. National Bait Inc. is built on a history of quality, innovation, and first class service - the key to our success for almost four decades! Since our inception in 1965, we have been Canada's leading supplier of quality freshwater fishing bait. We have outgrown our facilities at an accelerated rate and changed locations four times to keep up with the expansion of our business. To date, we have sold billions of night crawlers, more than any other bait company on this continent. 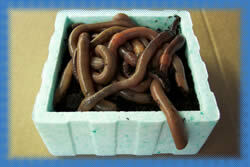 Our large Canadian dew worms are one of the best selling baits around. With unparalleled quality and competitive pricing, our bait is a great profit maker for wholesalers in Europe and in the United States. Night crawlers are our business and we do it best! Our unique cooling facilities keep our dew worms strong and healthy as well as enable us to have year-round supply and service. While other Canadian wholesalers may run out or find it infeasible to keep worms during the long, cold Canadian winters, we at National Bait Inc. maintain an extensive stock - this enables us to have constant supply right to your door year-round. 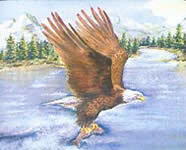 We thank you for visiting our web site and hope you enjoy your tour. If you have any questions or comments, one of our customer service representatives would be happy to assist you. Copyright © 2003 National Bait Inc.